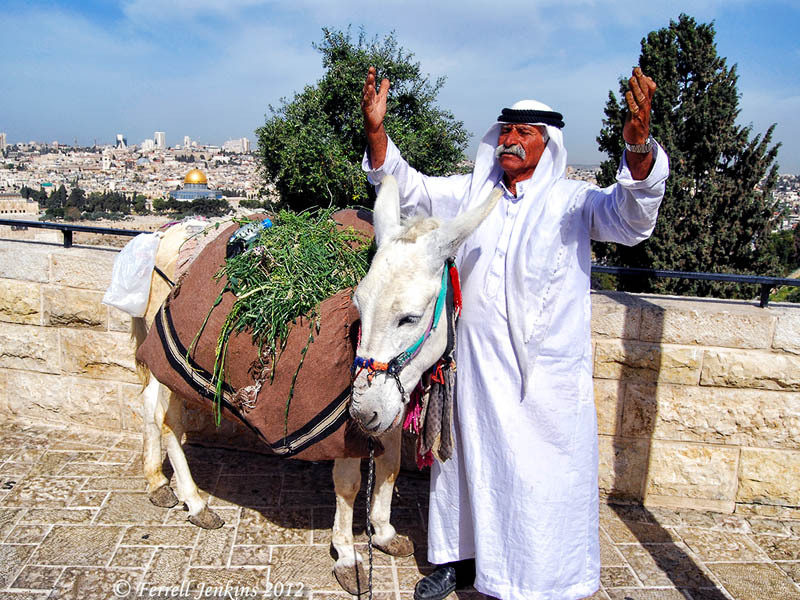 An "actor" on the Mount of Olives poses as a biblical character. Photo: Ferrell Jenkins. Wired Magazine recently ran a fascinating article by Chris Nashawaty dealing with the Jerusalem Syndrome. He interviews Dr. Pesach Lichtenberg, head of the men’s division of psychiatry at Herzog Hospital in Jerusalem. Lichtenberg and Nashawaty visit the Old City of Jerusalem in search of a likely prospect for Jerusalem Syndrome. Read the article in its entirety here. I had been unaware that visitors to Florence, Italy, experience a similar phenomenon when they “are overwhelmed by powerful works of art.” There, it is called Stendhal syndrome after the writer who described it in the early 19th century. Japanese tourists are especially subject to Paris syndrome while visiting the City of Light. The sights of Jerusalem are truly impressive, and some tourists who tend to be emotional are often brought to tears by what they see and hear. 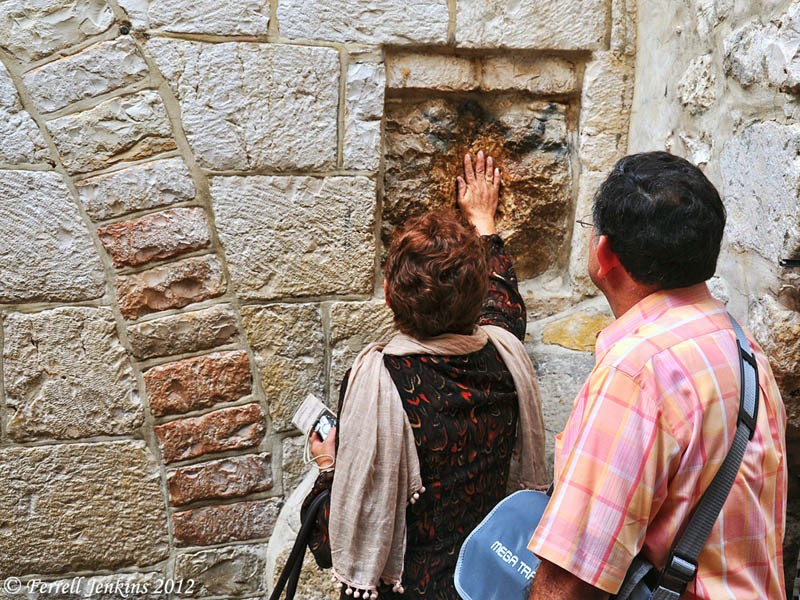 A woman places her hand on a stone at the fifth station of the cross. Some say this is a stone touched by Jesus on His way to the crucifixion. Photo by Ferrell Jenkins. It is not every day that you see someone like this selling jewelery and souvenirs. 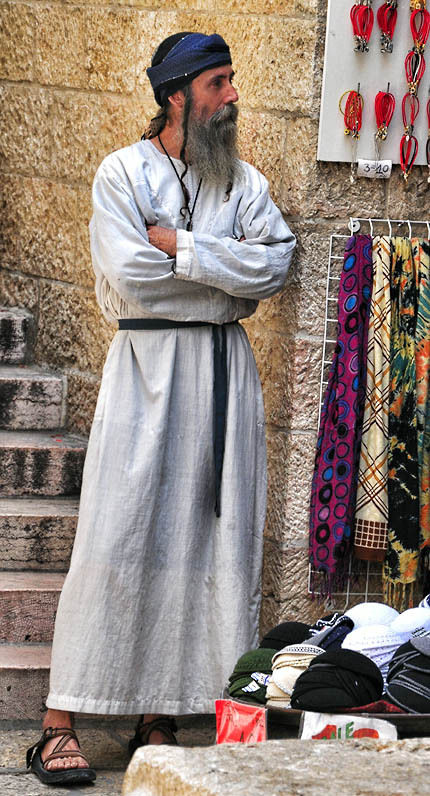 Vendor in the Jewish Quarter of Jerusalem. Photo by Ferrell Jenkins. We ran a brief note about the Jerusalem Syndrome about four years ago here. HT: Either Jack Sasson or Joseph Lauer (perhaps both), but I have misplaced the Email. This entry was posted in Bible Places, Bible Study, Culture, Israel, New Testament, Photography and tagged Jerusalem Syndrome. Bookmark the permalink.